Lasuni Dal the name itself gives spicy garlic/lasuni aroma. Garlic is also know Lasun in Indian language in Hindi and Marathi. 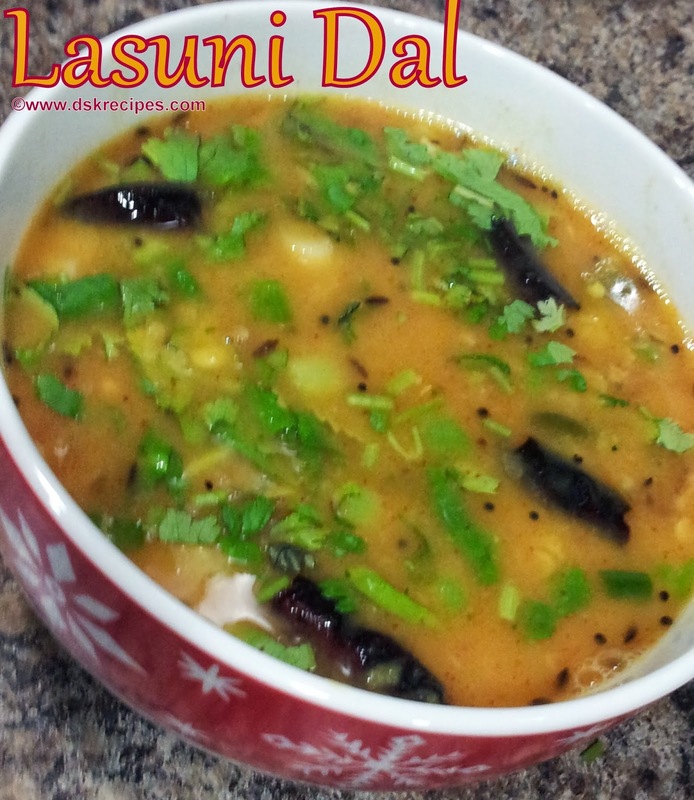 Lasun adds great flavour to food be it any cuisine. This dal can be accompanied with rice and chapati. 1. Soak the toor dal and moong dal in water for about 15 mins. 2. Take a container, place it on stove and add the soaked dals into it along with water. Add enough water that is around 5 cups. Keep the flame on medium to high. 3. Finely chop tomato and roughly chop the green chilies. Add the tomatoes and chilies to the container. 4. Add turmeric powder and some salt to it and stir well. 5. Cover the container with a lid and cook the dal with occasional stirring until the dal becomes soft and mushy. 6. Finely chop around 7-8 garlic cloves and keep them aside. 7. Once you see that the dal is soft and cooked, take a whisk and mash the dal with it. So that all the tomatoes and chilies get mashed along with the dal. 8. Now for tempering, heat another pan and add ghee or butter to it. 9. Add cumin seeds and asafotida. Add dried red chili pieces, chili powder, coriander powder and the chopped garlic to it. 10. Once garlic turns light brown add this tempering onto the dal. 11. Add salt as per taste and water as per desired consistency. Boil it for a few mins. 12. Add chopped cilantro and serve hot. Thankyou Devika Kulkarni for sharing the recipe.